How much does a plant cost? Is there a fee to join Inside Green? To start, we're giving 500 plants away for free, distributed through group-delivery and drop off spots. In addition, you can register an existing plant, or a plant you purchase yourself – feel free to use our Plant Picker. What kind of plants are a part of the project? Can I bring in my own plants? Our Plant Picker includes ten hardy and easy-to-propagate plants. You can find out more about them here. Once you sign up we'll send you tips and reminders on how to look after these plants. In our next phase we'll expand the number of plants we're supporting, but ten is plenty to start! I've never taken care of a plant before. What if my plant dies? It's important to us that this is a no shame project. If a plant dies, it dies – sad as that may be. The last thing we want is for people to think they don't have a green thumb or that they shouldn't have plants. Instead we hope you'll return to our Plant Picker to try out different plant match and keep learning about plants! Is there an Inside Green community garden my family can be part of? How does the site protect my privacy and keep my information secure? We're collecting information so we can learn about Vancouverites and their plants, and we're eager to see what the data tells us. Anything we report out will be general conclusions and observations. The only time we'd identify you specifically is if we use your image or if we profile you in an audio or photo story. And of course, that would all be done with your awareness and consent. Who is behind this project? Who are the experts involved? When Sue Biely dreamt up this idea she knew she needed a serious plant person to flank her. Graciously Brain Minter (yes, the Brian Minter, Order of Canada recipient and amazing plant guru) came on board. He's the expert behind the plant-related content, so we figure that's a gold star approval! Find out more about Brian here. I have been gardening for over 20 years. How can I contribute to the project? Yay, we love that you are interested in helping!! We need volunteers who can help other people when they have questions or support when it's time for them to propagate their plants. We also need donations, sponsorships, and groups of people to help spread the project. We're eager to see this idea go global, to many urban centres. After all, plants are everywhere and we are all collective Stewards. I'm a grade school teacher. How can I get my class to take part in Inside Green? Send us an email and let's chat. We'll need some help figuring out the best way to work with schools, so a keener on the inside would be amazing to talk to! Are you open to sponsorships? YES!!!! We have a few ideas of how that may happen. Please fire us a note and let's see what we can work out. 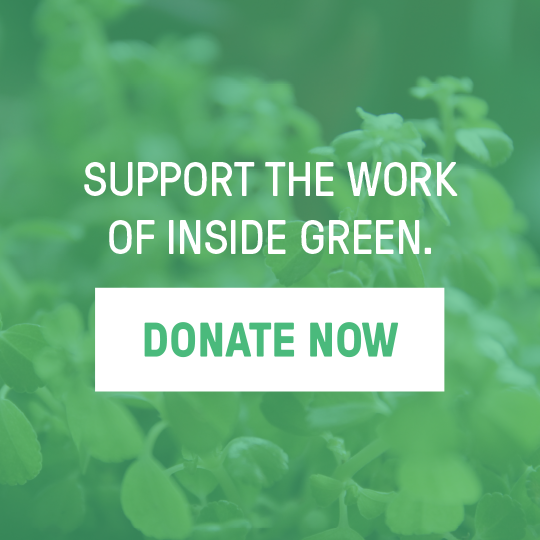 Can I donate to support the growth of Inside Green? YES!!! Please bear in mind that we're not a non-profit so we can't provide a tax receipt. We can, however, put your money to good use to grow the project. Please email us if you want to talk about how your donation money will be used. Why are we not focusing on plants that grow food? There are already lots of great initiatives fostering kitchen and community gardens. We're interested instead in what we're calling Companion Plants – plants that stay with us in our homes for years, growing alongside us greening our everyday lives season to season. And we think it's pretty cool to understand how a plant works enough to propagate it. Which gives you the coolest gifts in the world to give away, to help continue the cycle of greening from the inside out! To start, we suggest you visit the Plant Care page. Select the plant you want to propagate and click on the picture. In the Plant Care section you will find an easy step-by-step video on propagating your plant. I Made a Plant Baby, What do I do? Send an email to the person you want to gift this plant to. I've gifted you a plant from the project Inside Green. Please go to Insidegreen.ca and register. At this point, you are the proud new Steward of the plant I propagated! Please feel free to change it's name, upload photos, or tell stories about your experience with this new piece of nature in your life!